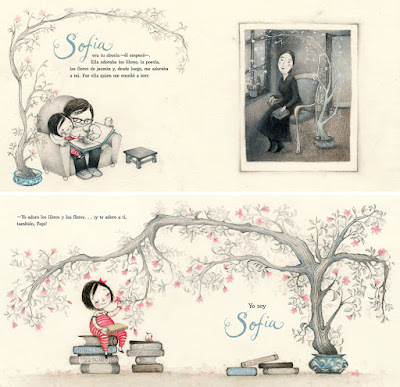 In Alma’s search for her identity, Martinez-Neal tells a gentle story of family culture and history and fills it with illustrative detail that will encourage the youngest readers to embark on their own journeys of self- and family discovery. Alma’s papi opens their blue family album. Its photos carry everyone’s story and, as Alma learns about her ancestors, she sees the connections between them and herself. In some of the illustrations, Alma steps into a photograph and meets a relative; for instance, lighting a candle with her curandera great-aunt Pura, who turns around and smiles at her. And as she draws or paints a representation of each of her forebears, she happily takes in what is special about that person by adding another name to her own. The left side of several pages and some double-page spreads as well depict our niñita, in pink-striped overalls, on her adventure; while some pages on the right side depict old photos of the ancestors whose names she carries. Youngsters may ascertain that the pink tones indicate the present, while the blue and blue-gray tones represent the past. As the pages turn, some of the blues—such as a family photo album, the books, an old trunk and its contents—are gifts from her ancestors and move to the contemporary side. On every page, Alma wears a red mal de ojo bracelet, a charm her great-aunt had tied around her wrist when she was born to keep her safe and connected. As well, a tiny bird, her companion and support—is the first to notice the relatives and continues to interact with them—and is always present to guide her. Martinez-Neal’s design employs lots of white space and limits her palette to pinks, blues and blue-grays. For the cool and warm grays on the pages that depict historic photographs of Alma’s ancestors, she used Prismacolor pencils and graphite, then reversed and transferred the art to handmade textured acrylic paper. For the blues and pinks on the pages that depict contemporary scenes, she painted directly onto the paper. As the story progresses, youngsters will discern past and present coming together in Alma’s life. In both the English and Spanish versions, everything that Alma sees and labels—including a large map, many countries of which, with her little bird's assistance, she’s connected with the red string of her bracelet—is lettered in Spanish. Since Alma is Peruvian, this makes cultural sense. In hinting at some things, it’s clear that Martinez-Neal leaves a lot for interpretation, illustrating the family’s continuum without words. For instance, there’s a photo of Alma’s abuela, Sofia, sitting alone. Next to her is a young jasmine-looking plant in a small pot. On the facing page the grown plant, in a blue pot, frames father and daughter, who are sitting together. As such, Martinez-Neal illustrates these familial relationships while providing space for young readers to finish the story in ways that are meaningful to them. 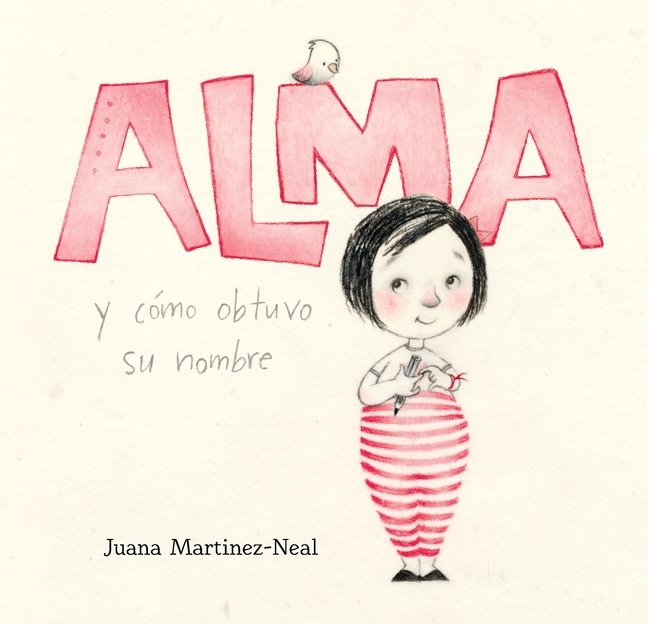 Youngest readers (and older readers as well) will relate to Alma y cómo obtuvo su nombre and Alma and How She Got Her Name, and teachers and librarians will find tons of teachable moments here. Both versions of this loving story are highly recommended.